Optimism and cheers with a twinge of sadness and tears were in attendance for the Mets on Opening Day on March 29. Hopefulness surrounded the Mets as morning rain gave way to a crisp March afternoon as the Mickey Callaway Era began with the 42-year old Tennessee native guiding the Mets to a 9-4 victory over the Cardinals in his managerial debut before a sellout crowd of 44,189 fans at Citi Field who were grateful for the end of winter. 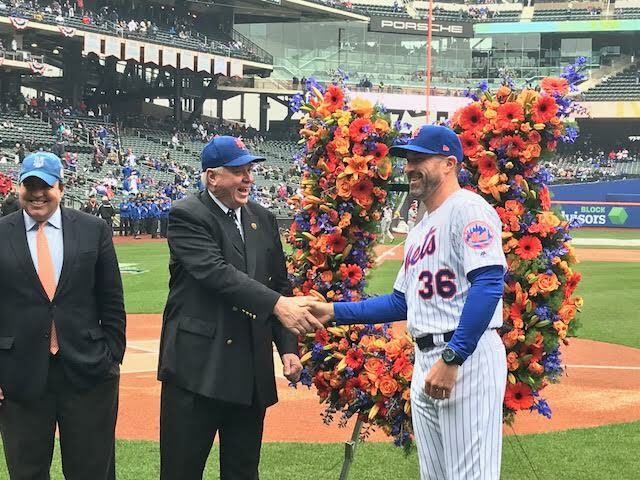 However, while the fans cheered the player introductions along the first base line as they looked ahead with optimism for 2018, the festivities also included a moment of silence to reflect on the legacy on and off the field of Mets Hall of Famer Rusty Staub, who passed away at the age of 73 earlier that morning. After a disappointing 2017, the Mets brought in Callaway, a successful pitching coach with the Cleveland Indians, along with veterans like Todd Frazier, Jay Bruce, and Jason Vargas during the offseason to help revive the team’s fortunes. Meeting with the press before the game, I had a chance to ask the new Mets skipper about the advantages and challenges of being a rookie manager of a mostly veteran team. Noah Syndergaard struck out 10 Redbirds and walked none in six innings as the Amazins provided more than enough offense to earn the six foot six righthander his first win of the season. Speaking of the team scoring nine runs without the benefit of a home run, Callaway cited the contributions of newly promoted hitting coach Pat Roessler and said, “He wants all of our guys to be an all around hitter” and not just focus on hitting homeruns while emphasizing the importance of getting the one pitch they can hit and not missing it. The Mets are a famously good team on Opening Day but they kept the good feelings alive into the first days of April with promising first outings by Jacob deGrom on Saturday and Matt Harvey on Tuesday against the Phillies in winning four of their first five games. After concluding this opening homestead on April 4, the Mets will travel south to our nation’s capital in time for cherry blossom season and to face their rivals, the Washington Nationals. Prior to the game on Opening Day, Keith Hernandez and Ron Darling met with the press and talked about the passing of their former teammate and friend Rusty Staub. They cited both his accomplishments on the field and his charity work off the field, most notably with The Police and Fire Widows and Children’s Benefit Fund. With tears in his eyes, Hernandez referred to Staub as a dear friend and said he had a place in Mets lore and in the city and later smiled as he recalled how Staub wouldn’t let him see his book on pitchers because he hadn’t “earned it” yet though Staub later gave it to him when he retired. Darling said he never met anyone like him, calling him a “Renaissance kind of man” who helped him when he was breaking in the Mets. “He had a connectivity to people,” Darling said. 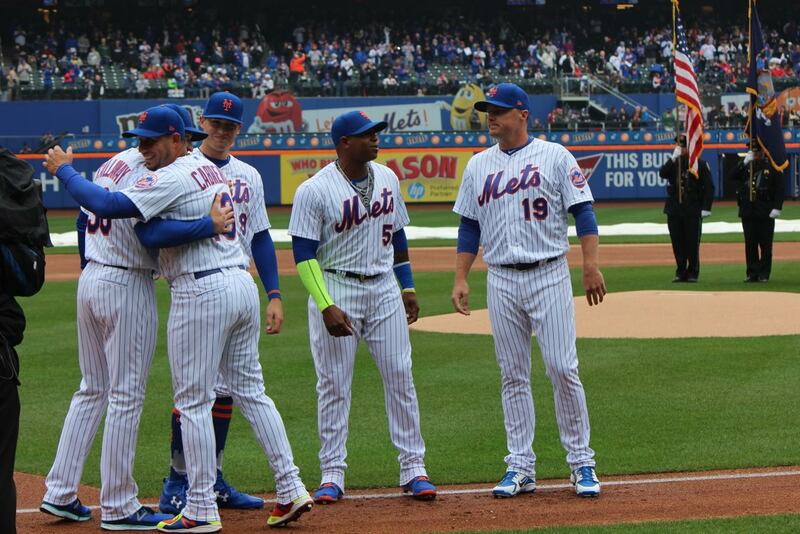 The Mets later announced the team’s uniform would feature a commemorative patch in honor of Staub. Finally, the Mets finale with the Phillies was viewable solely on Facebook. Wednesday afternoon’s 4-2 Mets win was the initial game in a 25-game package between MLB and the social media giant. For MLB, it offers another opportunity to market baseball to a younger audience, while Facebook gets to diversify from its standard offering of cute dog videos and irate political debates.